Accommodation in Slavskе - cottages of Slavskе - cottage "Boykivska khata"
Slavske, сottage complex "Boykivska khata"
Accommodation in Slavskе in wooden two-storey cottages. All the amenities. Sauna and tubs with medicinal herbs. A children's playground. 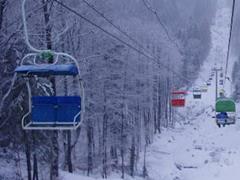 Distance to the nearest ski lifts in Slavske on the Trostyan Mountain is about 2 km. If you are book a room on 2 days discount is 20%, on 3 days - 30%. Slavske, cottage complex "Boykivska khata"
Cottage complex "Boykivska khata" is located 800 m from the Centre and the railway stationof Slavske. The ski lifts on the Trostyan, Pogar are in 2 km away. 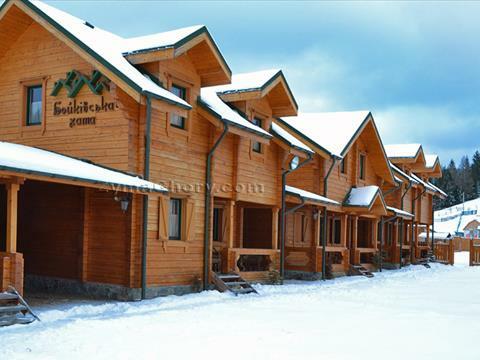 Cottage complex "Boykivska khata" is six two-story wooden cottages. On the ground floor of each cottage there are a living room and a fully equipped kitchen. The compleх has a big fenced area. Cottage complex "Boykivska khata" offers accommodation in Slavsko in the comfortable cottages in double and triple rooms. You can rent a separate room or the entire cottage. • cold and hot water round the clock. The bathroom (toilet, wash basin, shower) is on the ground floor. The cost of living in Slavske in a cottage complex "Boykivska khata" is per cottage per night. Rental price 2-bed room is 600 USD per night, 3-bed room - 900 UAH per night by February 28, 2017. For reservations require prepayment of housing - 50% of the rental value of the card account in Privatbank 5168 7427 0118 7464 in the name of I.M. Galeta. Cottage complex "Boykivska khata" village Slavske offers half board. In cottage is the a kitchen for self-cooking. • hydromassage baths in the open air. Ustyianovych St., 56-b, village Slavske, Skole region, Lviv oblast, cottage complex "Boykivska khata"
Cottage complex "Boykivska khata" invites you to rest in Slavske! 2-bed room 2 floor Double bed, bedside tables, table lamps, wardrobe, bathroom on the floor. 2-bed room 2 floor Two single beds, bedside table, table lamp, bathroom on the floor. 3-bed room, 2 floor Bunk and a single bed, bedside table, table lamp, wardrobe, bathroom on the floor. Living-room on the 1 floor Double sofa bed, two armchairs, TV, kitchen, bathroom (toilet, wash basin, shower) on the floor. Virtual tour includes 3D panoramas of cottage complex "Boykivska khata". To play 3D tour need to click on the picture above.